Greta is at present eight years old. She is doing well and in good health. Greta attends the third grade at school and comes to our feeding programme centre together with her class friends. Her favorite subject at school is Language and her favorite color is pink. During the afternoons when she is freed from her school homework, she likes to play hide and seek with her friends or cousins who live near her home. Greta future dream is to be a business manager and do accountancies. Greta started to attend the feeding programme at Katjel every Tuesday and Friday and enjoys the combined meals cooked and served to the participating children. She likes the fried chicken, sausages, pasta and rice served by our cooks. Greta attends the Bible classes for the children who are same age with her and enjoys singing to praise the Lord Jesus and learning from God’s Word through the Bible stories. At the end of the Bible lesson, she and the other children spend time to play at our feeding centre under the care of our teachers. A free dental care will be offered to her once a year by our dentist. Greta’s family is contained by five persons. She has her father, mother, grandfather and a brother. Her brother’s name is Egli. He is sixteen years old. Egli is also in our programme. Greta’s grandfather is also living in this home and under the care of this family. He is retired and receives a pension. Part of this amount he gives to the family who cares to supply his needs and provide for his living. Her father is jobless and the only way for him to provide the income needed to supply the family is by emigration. He goes for eight months each year in Greece and there he works in a chicken company. What he earns is a secure income and available to be used in food and clothes, but still too less to cover all needed in his family. Same as all families in the village, they own land but they haven’t planted anything on it yet. They also don’t raise animals. The mother does the housekeeping and works in the vegetable garden. 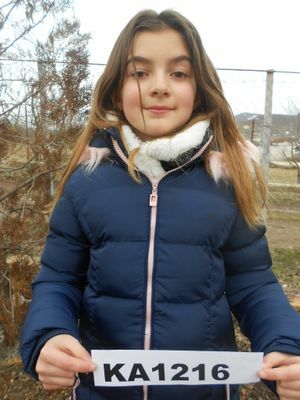 She will start to plant it on spring and gain vegetables for consumption in their meals.